Myanmar’s largest city is a “must-visit” destination on any traveler’s South East Asia bucket list. With over 6 million residents it truly is a place of contrasts; where high-rise buildings sit amongst vibrant and colourful markets selling all manner of goods and where processions of Buddhist monks weave their way through the bustling streets of commuters. A trip to Yangon can be a daunting affair for the first-time visitor so here are 5 attractions you simply can’t miss while in town. The pagoda is less than 10 minutes by car or a shade over 2 kilometers from Chatrium Hotel Royal Lake Yangon and guests can also enjoy the stunning views of the edifice from the comfort of their room’s large private balcony. The biggest and grandest pagoda in the whole country Shwedagon Pagoda is by far the oldest Buddhist stupa in the world at an incredible 2,600 years old and one of the main stopping off points on any Yangon devotee’s tour. Plated entirely in precious gold Shwedagon shimmers like the sun during the day and sparkles like the stars in the night sky once the sun goes down. Sitting atop Singuttara Hill and an impressive 325 feet tall the stupa is visible from many areas of the city and is one of Yangon’s most striking landmarks. As one of the region’s most well-known Buddhist sites devotees from many nations travel from both near and far to worship at Shwedagon and the sight and smell of thousands of candles and incense sticks lit in worship of the Lord Buddha is a truly intoxicating and mesmerizing sight creating memories that will last a lifetime. Accessing the pagoda is extremely easy with many bus routes going to Shwedagon Road or one of Yangon’s taxis will be happy to take you there-but don’t forget to haggle the price! A 2-minute walk from Shwedagon Pagoda’s East Gate Kyay Thone is only 1.6 kilometres or 6 minutes by car from Chatrium Hotel Royal Lake Yangon. Just before you reach the Shwedagon Pagoda’s East Gate you’ll come across the picturesque Kyay Thone Pagoda on Gyar Tawya Street. Unlike the typical stupa-style Burmese temples dotted throughout the country Kyay Thone was created in an ornate and vibrantly coloured Chinese architectural style reminiscent of temples found in the Middle Kingdom. The main temple structure sits on water with a bridged pathway leading to it and is surrounded by smaller “islands” which are home to a number of delightful mini temples. Inside the main temple is an imposing golden Buddha idol with many smaller ones keeping it company and the temple compound also contains a number of fascinating artifacts of days gone by including ancient suits of armour and historically interesting local currency. Kyay Thone is well worth a visit not only to observe the beautiful and tranquil buildings and stunning idols but also as the perfect opportunity to step into Myanmar’s glorious past. Chinatown is a short walk from the Sule Pagoda mentioned below and 5 kilometres or 14 minutes by car from Chatrium Hotel Royal Lake Yangon. 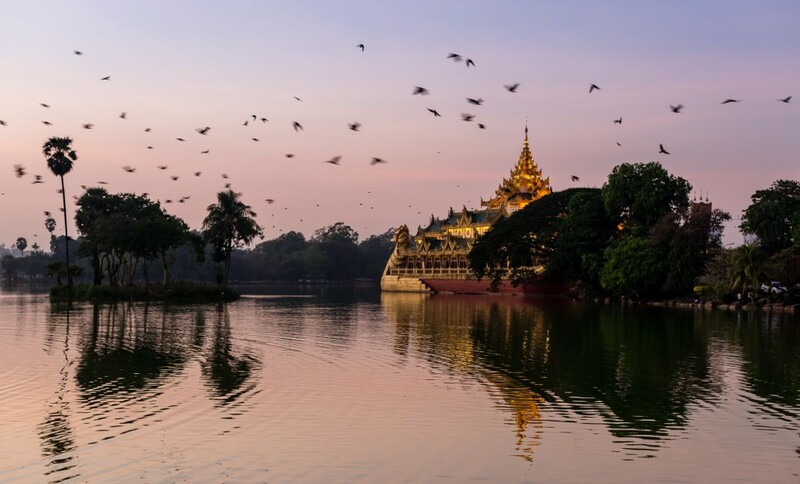 Many cities throughout the region boast a Chinatown where the descendants of the Chinese traders who centuries ago traversed the oceans plying their wares set up home and Yangon’s Chinese district is a must-see on any visitor’s itinerary. Wandering the packed streets alive with the exotic sights, sounds and smells of the real Asia certainly tells visitors that “We’re not in Kansas anymore, Toto”! For gastronauts who are feeling adventurous Chinatown is a foodie’s delight with a plethora of food stalls selling all manner of fare from the usual run-of-the-mill sausages and chicken to more “interesting” dishes such as chicken feet, pork intestines and some meats where it’s anybody’s guess which animal they came from! Of course if you’re looking for something that little bit more “familiar” Chinatown offers a wide choice of enticing seafood and the freshest of fresh exotic fruit. During the day Chinatown is more sedate and looks a tad different with less food stalls and more of the ubiquitous traders hawking dodgy DVDs and knock-off designer goods but at night the area comes alive and should be experienced for a truly memorable moment on your travels. The Sule Pagoda is 4.5 kilometres or 12 minutes by car from Chatrium Hotel Royal Lake Yangon. Legend has it that the site of the Sule Pagoda was originally home to a powerful “Nat” named Sularata or the Sule Narat, one of the Nat spirits worshipped throughout Myanmar. Sakka, the King of the Nats wished to help the legendary King Okalapp locate some of the Lord Buddha’s relics which had been buried nearby and asked Sularata to aid them as it was said that he had actually witnessed the event of their burial. Due to its downtown location the pagoda has become a focal point for many of the events which have helped shape Myanmar, including the “Saffron Revolution” of 2007 and the “8888 Uprising” in 1988 as well as being a religiously significant structure and is a Yangon landmark instantly identifiable throughout the country. The charming octagonal shape and gleaming spire of the Sule Pagoda marks the cityscape and is believed to house a strand of the Lord Buddha himself’s hair and is close to the tranquil and verdant Maha Badula Park, where visitors can take a leisurely stroll past splashing fountains to the towering white obelisk which commemorates the country’s independence from the British in 1948. Sule Pagoda also acts as a roundabout for Yangon’s traffic with all manner of vehicles, from belching buses and weaving taxis to the more sedate pedal power of the city’s rickshaw drivers vying for space in a tight-knit ballet of steel and chrome and most public and private hire transportation passes the pagoda at some point or another during the day. Guests at Chatrium Hotel Royal Lake Yangon can either stroll or hail a taxi to the lake which is a mere 5 minutes by car from the hotel or take in what is surely one of Yangon’s most perfect views from the privacy and comfort of their room’s private balcony. Chatrium Hotel Royal Lake Yangon’s namesake and practically on the doorstep of the hotel is a wondrous place to while away the time and a firm favourite for both locals enjoying the breathtaking scenery and visitors looking for a real Yangon vibe. The lake obtains its water supply from Yangon’s largest lake Inya Lake where the water is channeled an impressive 10 kilometres through a series of pipes to Kandawgyi and no matter if you’re a professional photographer or casual selfie fan provides picture perfect moments at every step with stunning views of the Shwedagon Pagoda making the perfect backdrop to show off to your buddies on Facebook or Instagram. The best time to visit is after dark when the sun has bid farewell for the day when the lake is illuminated by a multitude of lights creating an atmosphere of magical proportions. If you decide to take a stroll round the 8-kilometre circumference of the lake and feel a bit peckish a number of lakeside restaurants provide not only fresh and inviting fare but the perfect place to take a pew and breathe in the visual splendor of this amazing spot. The lake’s surroundings also contain the awe-inspiring Karaweik Hall, a fascinating combination of a palace and barge-like structure which appears to be floating on the tranquil waters and will be instantly recognizable to hip hop heads worldwide as the inspiration for the legendary Wu-Tang Clan’s logo. Next PostNext THE TIME IS NOW FOR CHATRIUM HOTEL ROYAL LAKE YANGON!